HA NOI (VNS) — Since the Mid-Autumn season started a few weeks ago, Vietnamese Facebookers have uploaded photos showing their own home-made mooncakes. Far from being an impossible dream, the trend has spread widely among young people this year. Queuing up for half an hour to get the cakes from the best bakeries can not only fray tempers, it makes many people wonder what all the magic and mystery is all about. "Last year, I queued up for ages to buy a box of the best mooncakes and was so annoyed I told my mother that this year I would bake them myself," said Diep Linh, a young bank clerk. After few days searching recipes on the internet as well as getting some tips from Facebook friends, Linh made her own. She was so excited and proud, she pasted photos of her achievement on Facebook with the note: "The first mooncakes I ever made! " Last year, another Ha Noi resident, Chi Nguyen used a cook on the internet to learn how to make mooncakes. "I didn't know the cook, but she showed all kind of cakes she had made herself. I was so inspired, I felt a strong urge to do it myself," said Chi. After her experimental effort, Chi now is confident of her baking skills. 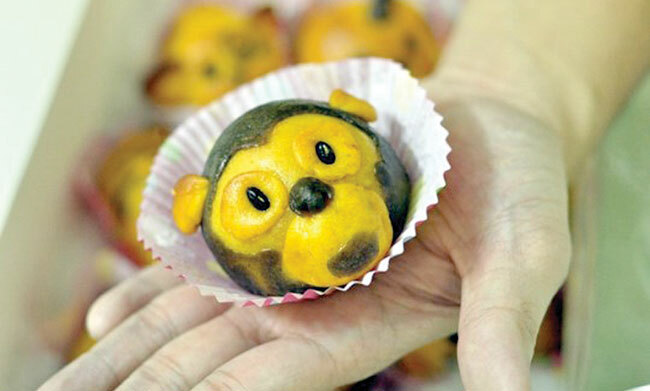 Over the moon: Cute animal-shaped mooncakes are best sellers at the online bakery run by Dao Nguyen Vu. "Last year, I made the cake with a stuffing of 10 ingredients," she said. "This year, I tried new recipes, including lotus seed and green bean paste." She presented her efforts to her French parents-in-law and friends. Many housewives are turning away from manufactured mooncakes because of reports of bakers breaking food safety violations and using cheap ingredients. Some men excel at the ancient art. One of them, Vy Tuan Anh, runs the Gato Baking Space in Dong Da District. He has been running several mooncake baking classes for a fee of only VND85,000 per person (US$4). Anh said there was a trend to get away from classic ingredients, such as green bean and lotus seed. "Young people have created a new style of mooncake influenced by chefs in South Korea and Hong Kong," he said. The most popular new flavours are green tea, orange and strawberry. Mooncakes with imaginative coatings include flaky and snowy mooncakes - even some made with jelly. And, instead of the traditional round shape with serrated edges, there are now cakes made in the shape of cute animals or famous cartoon characters. Tuan Anh said before launching his cooking classes six months ago, he and his eight-member team learned the basic baking techniques from a veteran chef in the Old Quarter. The veteran knows his stuff, as dozens of young practitioners will now testify. 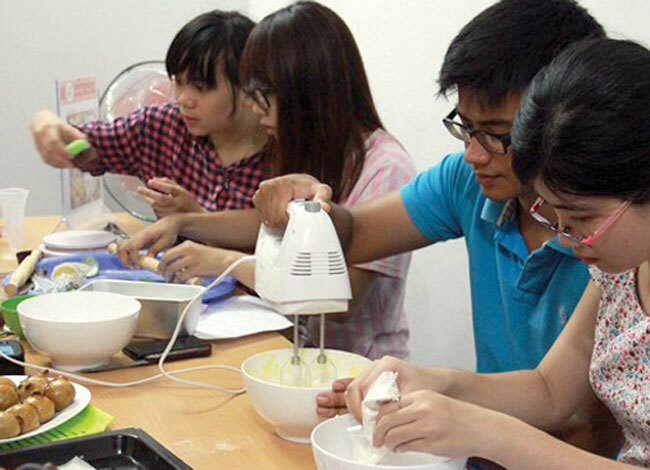 "One month before the Mid-Autumn Festival, the number of baking class attendees increases sharply to about 40 a day, especially at weekends," said Anh. Apart from techniques, Gato Baking Space also provides all the necessary ingredients. University student Ngoc Bao said she and her best friend spent their weekends at the class make glutinous and flaky mooncakes. "Next week, we will come back to learn how to create mooncakes in the shapes of the 12 animals of the zodiac," she said. Other popular mooncake classes, such as KitchenArt and EZcooking, also report being packed out with young participants, including many children. This season, Dao Nguyen Vu, 27, owner of online bakery Banh Handmade Meo Meo, received about 200 orders for his zodiac mooncakes, double the quantity ordered last year. Vu, who is a lecturer on graphic design at Viet Nam Fine Art University, said he started his business by chance. "Baking is my hobby and I often manage to do something new. I once tried to create the cakes in the shape of animals - and my friends loved them," he said. "They requested me to produce more, and then their friends also wanted some. That's the moment I decided to open my own establishment."